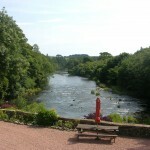 A great variety of common and rare birds can often be seen on both the River Annan and from within our grounds at the Riverside Mill bed and breakfast. The peaceful surroundings at our accommodation offer a unique base for bird watchers visiting Dumfries Galloway. Whooper Swans, Grey Herons, Kingfishers, Nut Hatches are among many of the birds already spotted this year. Our wildlife watch allows you to keep up to date with all the birds that live and visit this part of Southern Scotland every year. There’s the amazing site of the red kite feeding station just along the Red Kite Trail outside Castle Douglas by the beautiful Loch Ken which has proven a major success with over 30 mating pairs in the area. Also there is Mersehead near Dalbeattie where you can discover the breathtaking scenery and wildlife that’s typical of this region. Stroll along the nature trails and use the viewing hides to explore at your own pace. Some of the birds to be found here are Barnacle Geese, Lapwings, Pintails, Reed Warblers and Skylarks. Mersehead has many unique events throughout the year.